Hello and welcome everyone to a jam packed edition of Graps and Claps focusing on PCW’s 7th Anniversary celebrations in Blackpool and Preston respectively, with a total of 3 shows expect this to be a long and winding road that has probably taken up most of my Sunday afternoon to type whilst stuffing my face with Cheese and Crackers and Tomato soup. So let’s go back to Friday 17th August and the short train journey from Rochdale to Manchester Victoria. 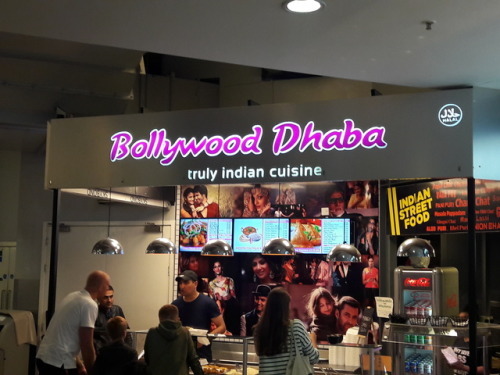 Arriving in Manchester I decided to visit once again – The Arndale street food market, this time trying out the delights of Bollywood Dhaba which is an Indian cuisine stall offering a range of curries, Onion Bhaji’s and Samosa’s. I went for a Chicken Jalfrezi which had a bit of a hot kick to it, I m glad I didn’t go for the Madras as I wouldn’t have survived to tell the tale of this weekend, the rice was nicely cooked but could have done with an extra 30 seconds of draining as it ended up leaving a residue mixed in with the curry sauce. Accompanying the curry was 2 Meat/Vegetable Samosa’s which weren’t much to write home about, all washed down with a can of Rio coming in at a cost of £7.80. Fully filled up, I met up with our Geoff for a swift half in Port Street Beer House who had a range of Estonian ales ranging from 7% to 14% in volume strength whilst also costing a pretty penny. I had a 6.9% Mosaik IPA (£5 Half) which was a red coloured IPA that was probably only worth the half pint volume, I think paying £10 for a pint is a step too far. With half an hour to go till we boarded the train to Blackpool we popped into the Piccadilly Tap for a half of a 5.9% Belgian IPA costing £2.90 for a half which was very similar to the drink I just had in Port Street. I would say with this pub, it isn’t a place where you would spend a few hours but it does act as a better alternative to the overpriced pub in the actual station. Arriving in Blackpool after an 1 hour and 15 minute journey, we was greeted with a blustery and wet Blackpool air a far cry from the heatwave when I last visited the seaside town a couple of months ago, First pub we visited was The Washington which is a Greene King with a good range of real ale and also the all important CAMRA Discount.which was was used to good effect with a pint of Lancaster Brewery Target 4.2% (£2.61), sadly though this wasn’t a great pint with a quarter of it being left as I went back to brave the rain once again walking to our hotel for the evening – The Ruskin Hotel which as regular readers know was featured in a previous issue for its Karaoke/Cabaret efforts. 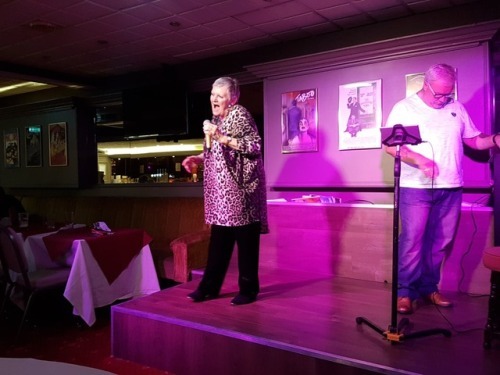 The Ruskin is one of them places where the average age of clients are in the 60+ range, it’s all a bit Phoenix Nights way but with a strange charm to it. For a 1-night stay it was £53 for a twin room, you can also add breakfast for £7.50 that is a buffet style breakfast. After dropping the bags off and a moment of freshening up, we hit the bright lights of Blackpool by going to the Britwres staple ‘Wetherspoons’ – The Albert and Lion that is located on the sea front. As we had an hour and half before the wrestling started and also a meet up with Andrew Carberry of Yellow Comedy fame, I had 3 pints of 5% £2.09 Coach House Brewery Blueberry Bitter that has been a regular tipple of mine when it has been on tap – give it a try if you see it in your local boozer. Arriving into The Blackpool Tower Circus which as ever was looking resplendent in all its glory to play host to PCW on this evening, taking our places in the tightly fit seats for the night’s action which got underway with a PCW Women’s Title Match between long time foes Nightshade and Rhio who have fought on no less half a dozen occasions with Rhio having the upper hand from the previous encounters. With the ladder match rules, the expectation of many attempts to climb the ladder to get the gold was expected and this didn’t disappoint. 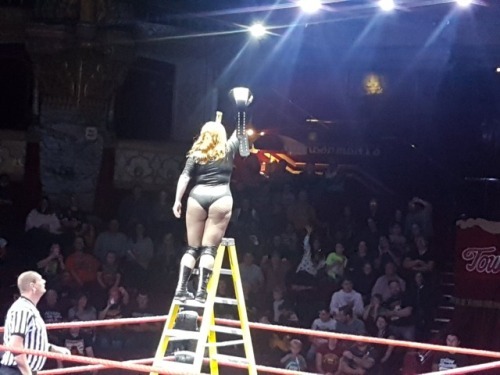 As Rhio was climbing the ladder looking like she was on the way to retain her title, the dastardly Nightshade pulled out a can of hairspray and sprayed Rhio in the eyes to send her packing to the floor. This left Nightshade all alone to climb the ladder to capture the PCW Women’s Championship and there we have a new champion which I am sort of glad happened but I am also hoping that Nightshade has some new opponents to face her and not the same round of challengers as what Rhio had in her reign. Second match up was one of the most anticipated matches of the evening as The Rascals (Desmond Xavier and Zachary Wentz) took on British Wrestling Legends Jonny Storm and Jody Fleisch, air traffic control was certainly in operation during this match. 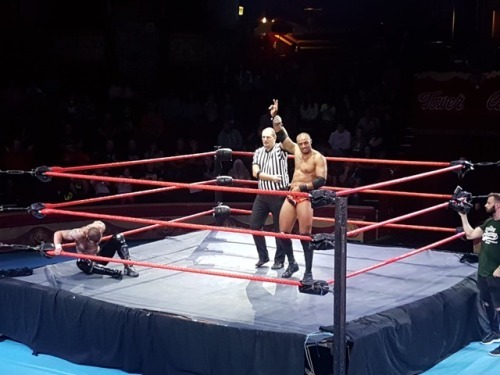 Wentz and Xavier dominated proceedings early doors by focusing there attack on Jody Fleisch whilst Jonny Storm was trying to provide encouragement on the ring apron. Once Jonny got the hot tag that was where the tide soon turned as Wentz and Xavier tried to hit the push moonsault to Jonny but Wentz missed and with Xavier being taken out by Jody, Jonny picked up the scraps to roll up Wentz for the victory. This was as good as expected! Third match up was a 6-way scramble match which is very much a PCW staple. Competitors in this match including Drew Parker (who looked like an extra from a 1990’s Levi’s jeans advert, he is probably carrying the best locks of hair in British Wrestling), Danny Hope (who was due to face a missing Bram), Dave Birch, ‘The Face of the Case’ Tel Banham and Jack Jester. This was a wild contest with the action going all over the circus making it difficult for Referee Des Robinson to keep order, with a lot of the competitors fighting on the outside, in the ring Dave Birch was about to finish Arcadian off with the Starkiller which he hit, but ever the opportunist Tel Banham sneaked his way back into the ring and and CHEEKY ROLLED UP Birch from behind to get the victory. Banham goes on to the next show the night after to face Matthew Brooks in the long-awaited Fans Bring the Musical Instruments match. Talking of Brooks, he was out next to face BIG T who was already ringside in Banham’s corner in the previous match with some interesting attire including a Singlet, Judges Cape, Slacks and Dennis Taylor spectacles – A Fashion Plate if I ever saw one ha! Any-whom not much to report in this match as it was a quick DQ victory for Brooks as Banham stuck his nose in to attack Brooks, Brooks however, fought Banham off and in a great feat of strength he bodyslammed BIG T to a great ovation from the crowd. I can say that my mate Carbs was instantly impressed by Brooks who commented on his look and his natural charisma (I am in full agreement of that). Next up we had an appearance from Trey Miguel who as I found out is one of Wentz and Xavier’s mates in The Rascals, his opponent for this evening was none other than our boy Ashton Smith – cue the dulcet tones of the Ogden boys mercifully killing ‘All of the Lights’ by Rihanna and Kanye West. This was an excellent match in this writer’s opinion which did take a time to get going due to the crowd maybe getting a bit tired from the lack of a break in action, Miguel is very much like his Rascal counterparts in his offence and he performed admirably but sadly for Trey he was unable to pick up the victory as Ashton used a bridging pin for the 1-2-3 to end a fine contest. 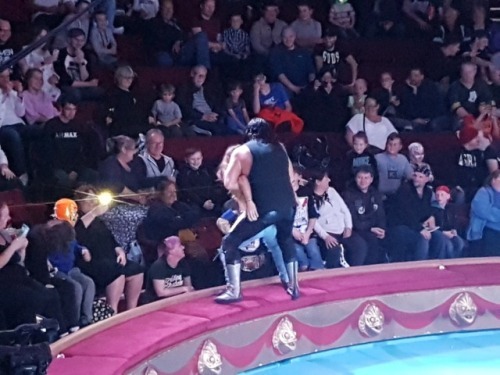 Next match was a Submission match which was a culmination of a Blackpool centric storyline between Joey Hayes and Sheikh El-Sham. Sham who has recently been tagging with Bram, whilst also having a number of impressive performances in the process in singles competition, he very much belies his 1 and half year in ring wrestling experience. Funnily enough I was there in person for one of his first matches against Joey Hayes in the PCW Academy, so you can say that this match had a bit of backstory from the past. Once again it was Sheikh who picked up a big win over one of the PCW originals Hayes with a clean as a whistle modified Camel Clutch victory, could this be a sign of big things to come for the ‘Shambolic One’. 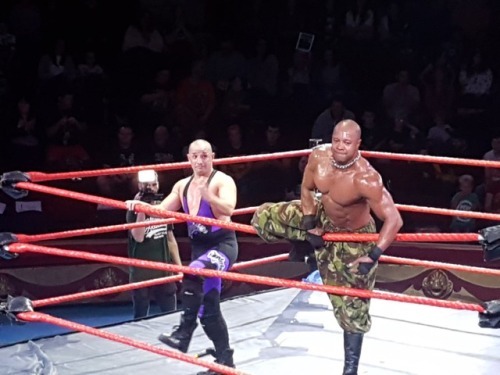 Up next was a contest that had an interesting clash of styles from the fun and antics of Honorary Brit Sugar Dunkerton taking on BritWres Legend Doug Williams. Early on Sugar did try to get Doug Williams to dance but Doug politely turned down the offer and insisted on wanting a wrestling match, which turned out to be a good treat to watch with Sugar using some impressive technical wrestling skills that I suppose some of his opponents probably forget due to all of his singing and dancing and in what was a bit of a surprise victory he rolled up a prone Doug for the victory. 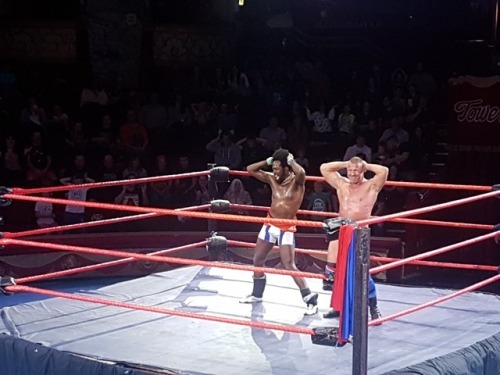 After the match and a show of respect, both Doug and Sugar proceeded to show off their dance skills the like that hasn’t been seen since my days of dancing in the Bury branch of Chicago Rock – as you can see Doug does a good Val Venis impression of gyrating. Sadly though this match had a lack of Sugar Sugar by the Archies which I have probably sang too much of this week (maybe 30 minutes christ almighty!). Main Event now with the clock coming up to 9 pm with a quite tired audience in my opinion, we ended with a PCW Championship match between the Champion Lionheart who won the strap in May taking on ‘The East End Butcher’ Sha Samuels which would decide who would face in one way or another Dean Allmark on the next evening for the PCW Championship. 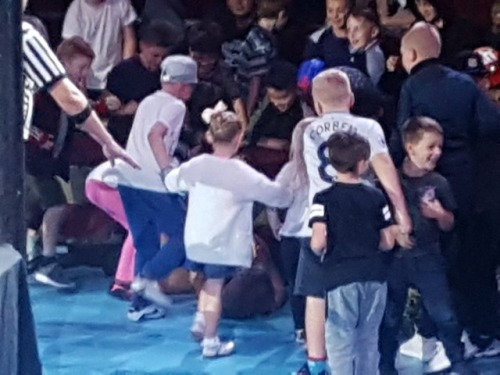 Early part of this contest went to the outside with Sha Samuels offering a huge queue of kids a chance to chop Lionheart which they duly all took up and in the end adding a few sly punch digs and kicks to a prone Lionheart which led to ring announcer RIchard Parker to ask for everyone to return to their seats. I sort of wish sometimes with these chopping spots in a cruel way, that someone the size of a Keith Lee or a Walter was sat on the end of the row and chopped their target in an almost comedic way. The finish of this match came when Referee Des who had a rough time on this evening with his officiating got hit by Lionheart on purpose to cause the DQ, leaving Sha with the victory and no title due to the title not being able to change on a DQ. Show over, we decamped to the other Wetherspoons in Blackpool for a couple of pints discussing the evening’s action before setting off back to The Ruskin Hotel to catch the latter part of the evening’s Cabaret Act who was performing hits from The Killers ‘Human’ to Neil Diamond’s ‘Sweet Caroline’ all performed admirably. With the cabaret done at 12:30 am it was time to go to bed and get some kip before the action on Saturday, on review the beds are very comfy at The Ruskin and especially when you are slept at the wrong end of the bed whilst nicking in the process my brother’s quilt ha! 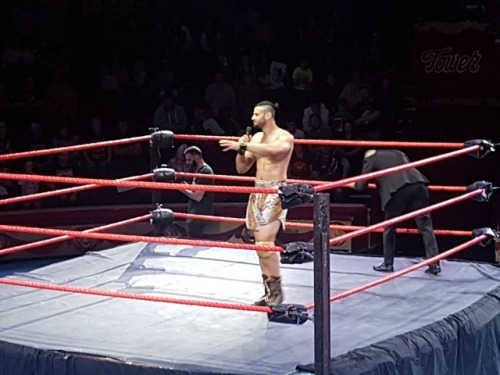 Overall with the show, it was a good 2 and half hour show in one of the best venues in the country for wrestling, if you have time and are not going to Germany for the WXW Tag League go and give their October 5th show a go with the return of Chris Masters at the Circus. Part 2 of the PCW Weekender will be up later on with the report of what went down in Preston, until then go and give this a share, leave any comments, whilst also giving a read of past reviews here on The Indy Corner.